The Climate Change Due Diligence Dashboard can be surveyed in minutes, letting business executives track the changing landscape of climate risks and opportunities in a way never before possible. It builds upon thousands of hours of climate risk and opportunity information aggregation and analysis, translating that information into an ongoing assessment of the business materiality of more than 40 risk variables and scenarios. Explore the open-access parts of the Dashboard here to better understand its business value. 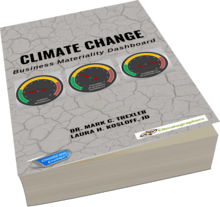 A yearly subscription costs $499, and includes full access to the Dashboard for up to 5 decision-makers from the same company, as well as access to regular webinars exploring how the business materiality of climate change is changing. Subscribers can also download the Dashboard to their desktop or mobile devices for a better user experience. Customized versions of the Dashboard specific to a sector or a company are available upon request. White Label versions of the Dashboard are also available for advisory firms to use with their clients.